The cover artwork is already promising, and the fact that you get more than 40 songs in just under 80 minutes should tell you already several things: 1. this is a compilation, 2. the music promises to be concise without relenting to overly short song structures, and 3. this should be a historical document which may not have the biggest impact on underground music, but which can eventually be interesting nonetheless. 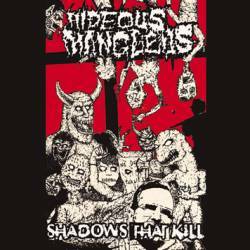 Hideous Mangleus were formed in the late 80s in the North East of the United States. Due to a lack of transportation, they never really toured that much outside of their home state, and also never made it to Europe (although that was only a close miss). I have never heard of this band before, but already the first couple of songs put me back to the nostalgic times when I discovered extreme music, and when the spirit was much more important than a clean and powerful production. So kids who think that extreme metal has only existed since the advent of Slipknot will get an ear infection by the lo fi qualities of this compilation. Not so those who grew up with suchlike music. If you have ever listened to Repulsion back in the good old days, you know what I mean. While the sound is very garagy, with the guitars emulating sizzling frying pans, and the drums doing their best to create a rhythmic onslaught, the songs themselves are far more charming than most anything you can purchase today. This compilation regroups mostly songs from the early Nineties, plus a couple of live and rehearsal tracks that deteriorate the overall high quality of the album with a sound that is even worse than what I recorded with my own punk band around the same time, and that should mean something! But if you concentrate on the first 50 or so minutes, you get a compilation of a rather unknown band that was totally great for that time, coming close to bands like very early DRI (with more of a metal edge of course), the long forgotten Wehrmacht and the aforementioned death metal pioneers Repulsion. There is even a cover version of an old Motley Crue song, showing the band's sense of humour, and if you are sceptical of grind bands, the liner notes prove that this is not just about gore, but also contains a lot of social commentary, and the band's websites have very extensive explanations of the band history and the several songs on the album. While this is not exactly yet a maximum rating album, I have to give it strong nine points, with the emphasis on the fact that had this album been released on a proper label ten or more years ago, they could very well have been pioneers too. This is amazing stuff!